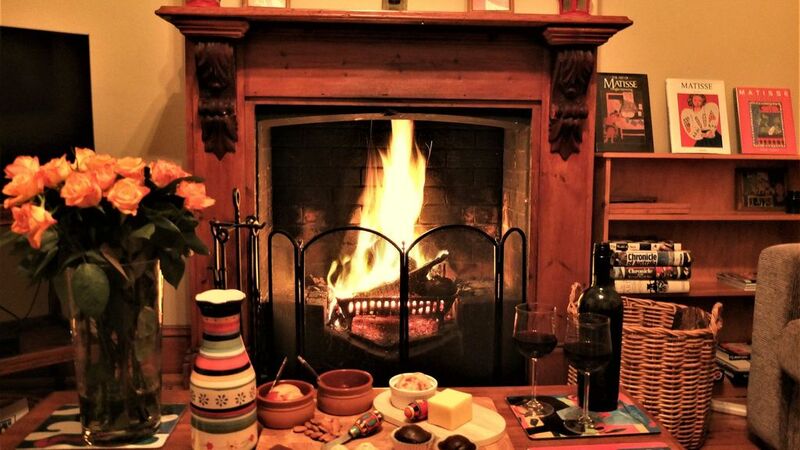 This 1880s character cottage is the perfect place to stay at any time of year. Enjoy Glenelg's white sandy beaches in summer, then stroll home for a glass of wine on the deck in the enclosed rear courtyard. In winter, warm yourself with a spa and relax by the cosy open fire. It is just 15 minutes from Adelaide Airport, and 30 minutes bus ride to the city, with great cafes and shops in easy walking distance. There is a private parking space in the courtyard. The cottage known to us as the "Matisse Suite" is decorated throughout with many of our favourite prints by Henri Matisse. Baltic timber kitchen is light-filled and has a stainless steel dishwasher, stove and oven. Classic black and white bathroom with generous spa. High ceilings and polished wooden floorboards throughout. Main bedroom with comfortable Queen size bed and ceiling fan. Lounge room with open fire, smart TV, DVD player and ceiling fan. Separate dining room with slow combustion fire and reverse cycle air conditioning. Single bed in the dining room can accomodate one more guest. Washing machine, outdoor clothes line, iron and ironing board. Pine deck with outdoor table. Parking nearby on street and in rear courtyard. Fully equipped with all you need for any length stay, make this your base and explore all that Adelaide and its lovely surroundings has to offer. The cottage is situated on a main road with a bus stop right in front. Double glazed windows and noise reduction ceiling insulation have been installed especially to soften the street sound. Although muted, it is still just audible so if you want perfect peace and quiet then this may not be what you are looking for. But if you want character, charm and convenience then this is definitely the place for you. Tea, coffee (espresso machine), condiments etc. Bed linen, bath and beach towels. Essentials such as shampoo, conditioner, body and hand wash, toilet paper, washing machine, kitchen and dishwasher detergents. A porta cot and high chair can be provided on request. You will be provided with a detailed house manual to help with frequently asked questions i.e. how to use the reverse cycle air conditioning, washing machine etc. The cottage is fully self-contained. As your hosts, we live a few kilometres away and we're happy to assist you with information if you need it. Please email, text or phone us if you have any queries or questions. We'll either greet you on arrival, or in the rare occurence that we can't, (or if you arrive very late) we'll arrange access with a key safe. There is laneway access to the cottage's rear courtyard and car parking space. We ask that you consider others and not park your vehicle in the lane as other neighbours need to use it. We want you to enjoy your stay in our cottage and this beautiful locality. If there is something we can do to help you make the most of your time here, please let us know. Glenelg South is a safe, quiet and friendly neighbourhood suburb. There is a small local shopping precinct nearby in Glenelg South, great cafes, pubs and shops. Your welcome book includes an easy guide to local coffee shops, takeaway food, activities and maps. One of Adelaide's finest sandy beaches. Jetty Road with a selection of restaurants, bars, fashion and boutique shops. Catch Glenelg's historic tram to the city. An IGA supermarket with extended trading hours. Port Noarlunga, a popular scuba diving and snorkelling location. Renowned Barossa Valley winery region. Comfortable, well equipped. Great location. Beautiful. Well cared for. So many extra touches including freshly baked bread on arrival. Plenty of tea and coffee and washing and cleaning products. Bus stop right outside and an easy walk to the beach and town. Loved it. Matisse Cottage was lovely, with great ambience. Beautiful décor and well thought out by the owners with you not needing to worry about a thing. It was all there and more at your finger tips. The "hot bread " was an added special touch as you could smell it as soon as you walked in. Bed was very comfortable which is definitely what you need when travelling all day. Would definitely recommend that you give this place a try, you won't be disappointed. Sorry we didn't get to enjoy the open fire place ! Wrong time of year. Very well presented and set up. A perfect get away in a great location! The owners were so welcoming and even had freshly baked bread waiting for us upon arrival. Will stay again in winter to utilise the open fireplace. Beautifully presented cottage, very comfortable and cozy. The hosts were very welcoming. We thoroughly enjoyed our stay and will looking to stay here again. It was a pleasure to host Brian and his family at our cottage. He was friendly and easy to communicate with. Brian left the cottage very clean and tidy. We hope to see Brian at the Matisse Suite again in the future. Our stay was a great experience from start to finish..
Great spot to stay when visiting Sacred Heart as we did but so close to Glenelg!! Would recommend and stay again!! From the moment I arrived, and was made most welcome by David, this little cottage was amazing. So very relaxing and comfortable! Absolutely perfect! !